Whether you live in Cape Coral, Fort Myers, Fort Myers Beach, Sanibel Island, Bonita Springs, Estero or Naples, our licensed plumbers expertly and expediently resolve and guarantee your every plumbing and drain service need. Because we recognize that plumbing emergencies will not wait, we are on-call 365 days a year, 24 hours and day, and 7 days a week. One call to Cape Shore Plumbing at (239) 677-9544, your local plumbing company, and you can sleep easy knowing that your household plumbing and drain systems will be as free-flowing as they were intended. When you choose Cape Shore Plumbing, you can rest assured that you will receive local plumbing services that include quality plumbing supplies and materials, and which are completed by professional technicians who have been trained to provide superior customer service. In addition, all of our local plumbing services are available 24 hours a day, seven days a week and 365 days a year. 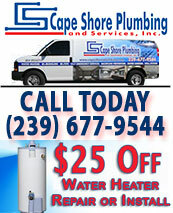 Cape Shore Plumbing company’s trucks are equipped with emergency parts, and a wide range of specialized plumbing supplies and equipment for both residential and commercial plumbing needs. Cape Shore Plumbing has earned, and continues to earn, the trust of its customers because it is committed to the highest quality of craftsmanship, provided promptly and courteously. No matter what your local plumbing services need is, the highly trained plumbing professionals at Cape Shore Plumbing, will provide you with the quality service you expect. One call to the expert plumbers at Cape Shore Plumbing at (239) 677-9544, and you can rest assured knowing that our plumbing response team will perform your work promptly and correctly the first time. At Cape Shore Plumbing, our work is properly licensed and insured, our services are backed by guarantees, and our services are available 24-7 for your convenience. 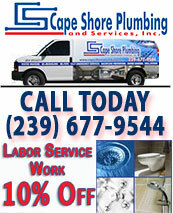 Cape Shore Plumbing, your family owned, licensed, insured, professional local plumbing busines. We are proud to offer emergency plumbing repair, water line repair, garbage disposal and drain cleaning servic, water heater replacement and all SWFL plumbing needs serving Lee County and Collier County, including the following areas! "George, Thank you for fixing my water leak last week and preventing a nightmare in my home. I really appreciate your professional services." "Jorge and his crew did a complete re-pipe for me and I couldn't be happier. I have great water pressure and no glugs of rusty water any more. A contractor friend of mine saw their work and said they did great work. Thanks Jorge!" "On two occasions I have had the need for a plumber. The first, to assist with a bathroom shower remodel. The second, to determine the cause of a challenging kitchen sink drainage problem. Both Jorge and his employee, Mike, responded in a timely manner, used thoughtful methods to minimize the potential mess, provided clear, helpful explanations, and were very consciousness in getting the job done. I was further impressed by the very reasonable fees charged for the services rendered. Dependable, thorough, and a job well done. Thank you." "Cape Shore Plumbing did a great job on my bathroom! I recommend your services to anyone!" "Just wanted to say thanks for the new plumbing that was installed. Everything looks great and works wonderful. I have used Cape Shore Plumbing for many plumbing needs on my new home: installing new drains, new valves, toilet repair, new refrigerator water line and more! I trust Jorge to be fair and the work is without flaw. 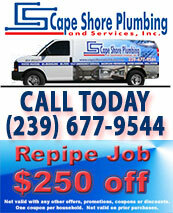 Thanks for a great job and I will be sure to recommend Cape Shore Plumbing to everyone that I know." "Thank You for all of your help! I really appreciate you getting the job done fast!"